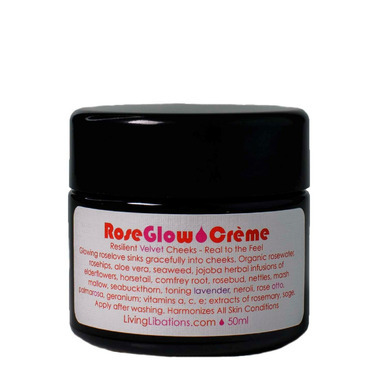 Living Libations Rose Glow Creme is a daydream of roses revitalizing rays that embraces pores with rosy adore. This creme of botanical grace will bring balance to your benevolent face as it sinks gracefully into your complexion. It harmonizes dry, pallid, and wise skin with a pure palette of of botanical bounty. The elegant pink hue and rosy aroma will grace your senses with a symphony of beauty for soft resilient skin. Directions: Apply after washing with a Best Skin Ever, (may we suggest Rose Best Skin Ever). Smooth on as a succulent daytime moisturizer or luminous night creme. For extra juiciness combine with a drop of Royal Rose or Rose Glow Serum. Ingredients: Water, Aloe barbadensis (Aloe Vera), Rosa damascena (Rosewater Hydrosol), Simmondsia chinensis (Jojoba), Butyrospermum parkii (Shea Butter), Hippophae rhamnoides (Seabuckthorn Berry), Citrus aurantium (Orange Wax), Rosa damascena (Rose Wax), Fucus vesiculosus (Bladderwrack Seaweed), Camellia Sinensis (Green Tea), Rosa canina (Rosehips), Equisetum arvense (Horsetail), Urtica dioica (Nettles), Althea officinalis (Marshmallow), Lavendula angustifolia (Lavender), Rosa damascena (Rose Otto), Citrus aurantium (Neroli), Helichrysum italicum (Immortelle), Cymbopogon martinii (Palmarosa), Daucus carota (Carrot Seed), Citrus limon (Lemon), Schisandra chinensis (Schizandra Berry), Pelargonium graveolens (Geranium), and Salvia officinalis and Rosmarinus officinalis (Sage and Rosemary) CO2 Extracts. I was a bit leery at first because of the smell...it smells great but a bit strong. After a few days, it turned out great. Leaves my face feeling smooth and soft. I'm in my late 60's so I' impressed. This will definitely be my go-to moisturizer. Works awesome under my foundation as well. Completely in love with this beautiful cream! I am 44 and going through many hormonal changes which are wreaking havoc on my skin. As soon as I put this cream on my face my skin felt different. The smell is divine. True rose and not overpowering. My dry spots were soothed and my red areas calmed. The best part is my skin is actually glowing for the first time in years!